Nancy turns mistakes on their head and helps you cleverly use them to students’ advantage. Each of the twenty-two activities in this book focuses on important ideas in grades 4–5 mathematics. 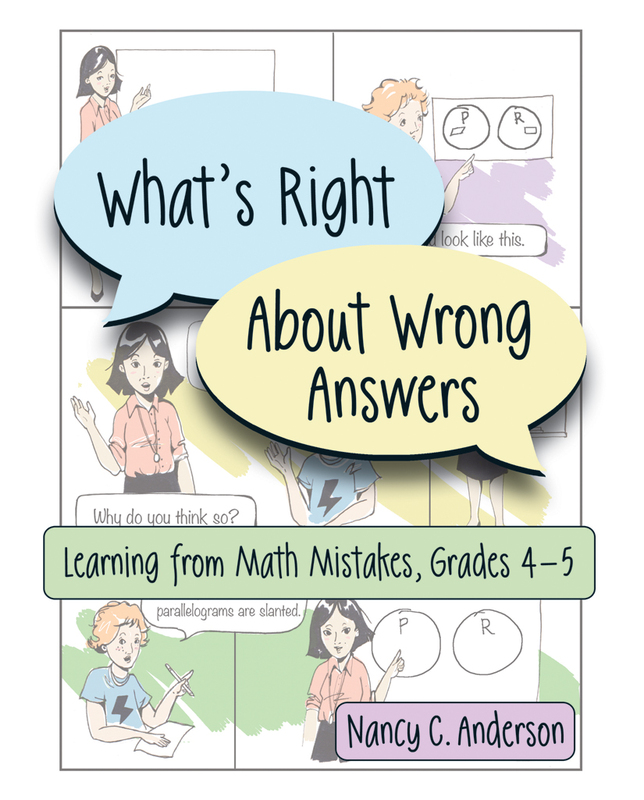 By examining comic strips, letters to a fictitious math expert from confused students, and sample student work containing mistakes, your learners explore typical math mistakes, reflect on why they’re wrong, and move toward deeper understanding. Nancy Anderson is K-8 Mathematics Coordinator and Grade 8 Mathematics Teacher at Milton Academy. Nancy is an experienced classroom teacher, curriculum specialist, and professional developer. Her other publications include Classroom Discussions in Math and Good Questions for Math Teaching, Grades 5-8. Nancy earned her doctoral degree in mathematics education from Boston University in 2012.